Asked if this summit would yield a political declaration to end the Korean War, Trump said, "We'll see"
U.S. President Donald Trump and North Korea's Kim Jong Un, leaders of two nations with a long history of hostilities, opened their second summit Wednesday with smiles, hopeful talk and a friendly dinner that will set the stage for more difficult talks to come about curbing North Korea's pursuit of nuclear weapons. "A lot of things are going to be solved I hope," Trump said as dinner commenced. "I think it will lead to a wonderful, really a wonderful situation long-term." Kim, for his part, said that his country had been "misunderstood" and viewed with "distrust." 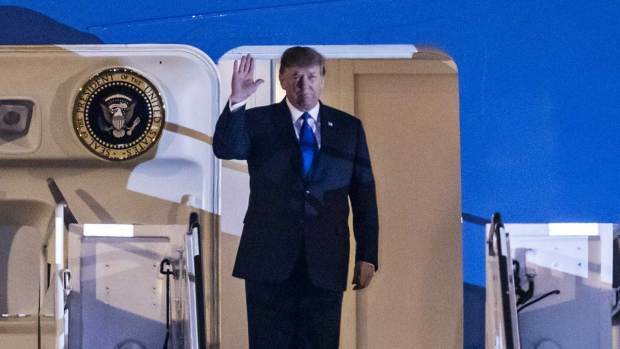 President Donald Trump touched down in Hanoi, Vietnam, for a series of meetings with North Korean leader Kim Jong Un, who arrived by train. "There have been efforts, whether out of hostility or not, to block the path that we intend to take," he said. "But we have overcome all these and walked toward each other again and we've now reached Hanoi after 261 days" since their first meeting in Singapore. "We have met again here and I am confident that we can achieve great results that everyone welcomes." Following a meal, the leaders departed the venue after just over two hours of meetings. The White House did not immediately provide more information on what it called a "social dinner." Asked if this summit would yield a political declaration to end the Korean War, Trump told reporters: "We'll see." Despite pushing an anti-smoking campaign in North Korea, Kim is frequently seen with a cigarette in his hands. 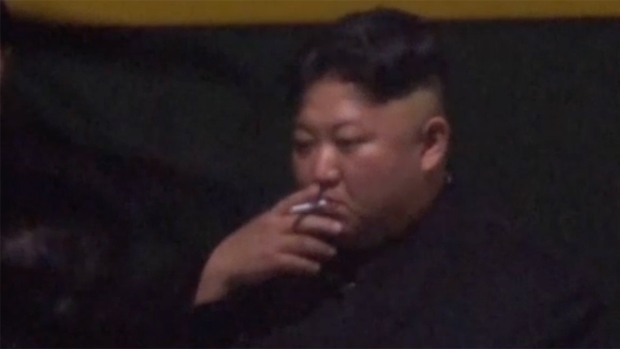 Footage by Japan's TBS TV showed Kim taking a smoke break hours before arriving in Vietnam for his high-stakes summit with Donald Trump. The two leaders were joined for an intimate dinner by Secretary of State Mike Pompeo, acting White House chief of staff Mick Mulvaney, Kim Yong Chol, a former military spy chief and Kim's point man in negotiations, and North Korean Foreign Affairs Minister Ri Yong Ho. Interpreters for each side also attended. As Trump reached for a summit victory abroad, back in Washington his former personal attorney, Michael Cohen, was prepared to deliver explosive testimony on Capitol Hill that the president is a "racist," a "conman" and a "cheat." Unable to ignore the drama playing out thousands of miles away, Trump tweeted that Cohen, who has been sentenced to three years in prison for lying to Congress, "did bad things unrelated to Trump" and "is lying in order to reduce his prison time." Anticipation for what could be accomplished at the summit ran high in Hanoi. But the carnival-like atmosphere in the Vietnamese capital, with street artists painting likenesses of the leaders and vendors hawking T-shirts showing Kim waving and Trump giving a thumbs-up, contrasted with the serious items on their agenda: North Korea's nuclear weapons program and peace on the Korean Peninsula. "I think that your country has tremendous economic potential — unbelievable, unlimited," Trump said. "I think that you will have a tremendous future with your country — a great leader — and I look forward to watching it happen and helping it to happen." 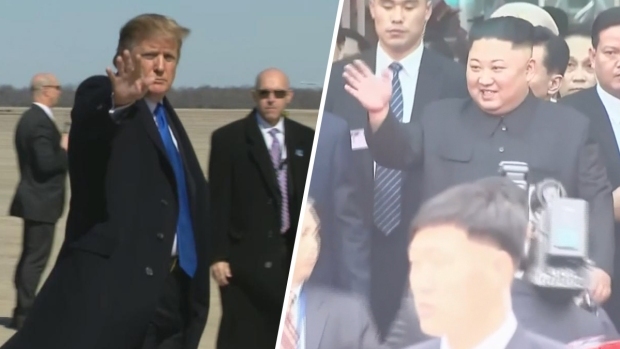 President Donald Trump is slated to arrive at Hanoi, Vietnam, Tuesday for a second summit with North Korean Leader Kim Jong Un aimed at denuclearizing North Korea. Trump is confident that North Korea would surrender its nuclear weapons, despite U.S. intelligence saying otherwise. North and South Korea also want U.S. sanctions dialed back so they can resurrect two major symbols of rapprochement that provided much-needed hard currency to North Korea: a jointly run factory park in Kaesong and South Korean tours to the North's scenic Diamond Mountain resort. Ahead of the private dinner, White House press secretary Sarah Sanders excluded some U.S. reporters, including The Associated Press, after reporters asked questions of Trump during a previous photo opportunity. "Due to the sensitive nature of the meetings we have limited the pool for the dinner to a smaller group," she said in a statement. AP journalists Hau Dinh, Hyung-jin Kim and Kim Tong-hyung contributed to this report.